Bio-degradable liquid laundry detergent. Does not contain harmful phosphates. Contains special water softening ingredients that allow it to be effective even in hard water. Contains anti-redeposition additive. Blue vicious liquid. Fresh fragrance. Strong enough to be used commercially. 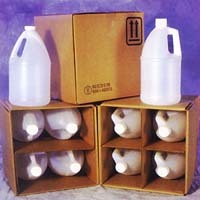 concentrated and gentle enough to be used in home front or top loaders.